The Town of Lantana is located on the southeast coast of Florida, in an area that uses groundwater exclusively for its municipal water supply. The groundwaters in the area typically contain excessive iron, organically bound color compounds, and high hardness levels. Historically, the Town of Lantana had used chlorination and fi ltration to treat iron and color. The aggressive chlorination that was used unfortunately resulted in the formation of disinfection by-products (DBP) such as trihalomethanes and haloacetic acids – in concentrations that exceeded newly promulgated federal standards. To address this problem, the Town considered installing membranes as a treatment alternative. But with reject rates as high as 20%, and costs nearly twice the allowable budget, membranes were difficult to justify. Withdrawal limitations imposed by the South Florida Water Management District contributed to ruling out membranes because of the high reject stream volumes. Membranes also have high capital and operating costs and would have resulted in a complete and costly re-work of the existing plant site. 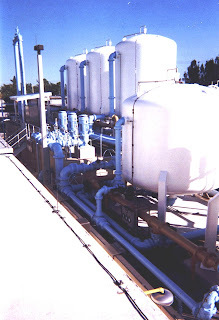 To solve the color and DBP problems, Mathews Consulting, Inc and the Town of Lantana worked with Tonka Equipment Company to design an economical and efficient ion exchange system for the 4 MGD water treatment plant. Included in the design were two new filter banks for iron filtration and three 12’-0” diameter anion exchange vessels for TOC reduction and color removal. Because the ion exchange system cost was significantly below original budget, the Town was able to install an additional two 12’-0” diameter cation exchange vessels for softening, thus giving the community soft water for the first time in its history. The facility is automatically controlled by a Tonka PLC control panel, and exhibits operator-friendly control graphics, valve accessibility, and the instrumentation for monitoring to ensure compliance. Tonka’s unparalleled experience in anion exchange systems to treat south Florida waters has assisted the Town of Lantana in delivering high quality water for its consumers on a cost effective basis. The Florida Institute of Consulting Engineers awarded Mathews Consulting, Inc the 2005 Grand Award for Engineering Excellence for their work on the Lantana project.